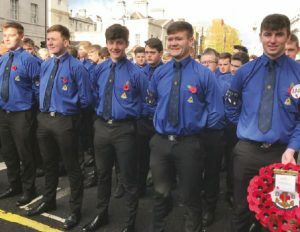 75 young people from across the Brigade took part in the National Service of Remembrance at the Cenotaph in Whitehall, London on Sunday 12th November. BB members from England, Northern Ireland and Scotland took part in the parade and laid a wreath at the Cenotaph. 7th Newtownabbey, 1st Greenisland, 1st Banagher, 1st Fintona and 1st Stevenston Companies. In addition to the events in Whitehall, BB members took part in civic events and Church services across the country.